The question of the Italian artistic heritage’s dispersion is very complex. The reason why a so large number of Italian works of art is still in many foreign countries, is due to several factors. Primarily, because of the misappropriation of the artworks due to foreigners regnant countries, that have made the history of Italy and that have succeeded over the centuries. Then, because of the phenomenon of collecting that has existed in a systematic way for over five centuries, and especially by the fact that from the unification of Italy onwards, the dispersion of the Italian artistic heritage came in succession thru hallucinating procedures and criteria, with the complicity of shrewd antique dealers, officials government, and by compliant and inappropriate laws and rules. Last but not least, the undue subtraction and thefts that constantly have been perpetrated against the Italian artistic heritage. Rightly, the Napoleonic plunder and the failure in giving back so many masterpieces, is always remembered in this regard, but if such dispossession make us indignant, we must also ask ourselves why in Italy came many other works that were not part of that looting (excluding those that definitely were already out of Italy before the nineteenth century). For the uninitiated, the Napoleonic thefts refer to a number of subtractions of goods, in particular works of art, made during the military conquests of Napoleon Bonaparte. The subsequent peace treaties were the legal instrument used by Napoleon to legitimize these divestitures: between the clauses he considered the artworks as a tribute to war. The works stolen by the Nazis and their allies before and during the Second World War, have been millions across Europe, including books and valuable documents. In this regard, we should remember the work done by Rodolfo Siviero, a non-commissioned Carabinieri’s officer, in charge of directing a diplomatic mission to the Allied Military Government in Germany, with the aim to establish the principle of restitution of stolen works to Italy. Since the fifties, and on behalf of the Italian Government, he has dealt systematically a search of all the works of art that were stolen and exported from Italy. This intense activity, which earned him the nickname “art’s 007”, lasts until his death in 1983. During this period Siviero often denounced the lack of attention that government institutions devoted to the problem of the recovery of our artistic heritage. Berlin 1945-1946, the Second World War is over and the Red Army occupied the city. And here begins the odyssey of many masterpieces which were secretly taken away by the Russians. According to the calculations of some German experts, the number of works of art disappeared from Germany, at the hands of the Russians, would be about one million of pieces. But we cannot know how many of them came from Italy occupied by the Germans, when Hermann Goering ordered the depredation. In the past, other artistic commissioners were instructed to “negotiate” the return of looted works but, among compensation, sales and prescriptions, many are no longer returned in Italy. Despite everything, I am consoled by the thought that Italian art would not enjoy such a universal reputation, if its works were not present in some of the greatest museums in the world. Louvre, British Museum, National Gallery in Washington, Metropolitan in New York, Hermitage in Petersburg, Alte Pinakotheke in Monaco of Bavaria, Prado in Madrid and the Kunst Historisches Museum in Vienna, which are visited each year by millions of people from every continent. And in each of those museums the visitor finds ‘Italy’. This “mutual advantage” is perhaps the only reason that heals our consciences. As mentioned at the beginning, there is no country in the world that has no Italian historical relic or masterwork on display in their museums, and albeit the largest number can be found in French and English museums, America is no exception. Although the United States have not their own art history (being officially founded only in 1776), following an optimal and targeted plan of purchase, persisted over the centuries, they hold great examples of classical art, medieval and modern, kept in so egregious way in their museums; the legitimacy of the housing is obviously questionable, despite the sensitivity of the issue: just think of one in all, to the Chariot of Monteleone di Spoleto now in the Metropolitan museum, illegally transported in New York from the Umbrian city in 1902, in the same years in which Italy was formulating a law to protect the assets belonging to its National Artistic Heritage. For Americans who read me, I would like to give a complete listing of all our works that are scattered on their territory, but a systematic and comprehensive research is impossible, and it will give back an endless list. I can tell you that about Michelangelo you can see the “Young Archer,” a marble sculpture of 1491, at the Metropolitan Museum in New York, and “The Torment of Saint Anthony” a tempera of 1487, at Fort Worth in Texas. About Caravaggio you can see, “Marta e Maria Maddalena “, olio su tela del 1598 all’ Institute of Arts a Detroit. “Sacrificio di Isacco”, olio su tela del 1603 al Princeton, Barbara Piasecka-Johnson Collection. “San Giovanni Battista”, olio su tela del 1604 al Nelson-Atkins Museum of Art, Kansas. “Crocifissione di Sant’Andrea”, olio su tela del 1607 a Cleveland Museum of Art. “Negazione di San Pietro”, olio su tela del 1609 al Metropolitan Museum of Art, New York e il “San Francesco in Estasi”, al Wadsworth Atheneum Museum of Art di Hartford. The Wadsworth Atheneum has other wonderful works of Italian medieval and modern art: sifting in the section relating to his collection on the official website, it is apparent the presence of historically important paintings by Italian artists, such as Ritrovamento di Vulcano, painted by Piero di Cosimo in 1505; the Ritratto di un uomo in armatura, 1512 by Sebastiano del Piombo; Giuditta e la serva con la testa di Oloferne, 1624, by Orazio Gentileschi; the Veduta di Piazza San Marco, 1750 by Canaletto; the Trojan Horse, 1773 painting by Giandomenico Tiepolo. The National Gallery of Art in Washington, D.C., has one of the finest art collections in the world. The strongest collection is the Italian Renaissance collection, which includes two panels from Duccio’s Maesta, the great tondo of the Adoration of the Magi by Fra Angelico and Filippo Lippi, a Botticelli on the same subject, Giorgione’s Allendale Nativity, Giovanni Bellini’s The Feast of the Gods, the only Leonardo da Vinci painting in the Americas, Ginevra de’ Benci; and significant groups of works by Titian and Raphael. In the Metropolitan Museum of Art you can admire works of Francesco Bartolozzi, Stefano della Bella, Bartolommeo Bonghi , Guercino (Giovanni Francesco Barbieri), Parmigianino (Girolamo Francesco M. Mazzola), Francesco Piranesi, Giovanni Battista Piranesi, Marcantonio Raimondi, Raphael (Raffaello Sanzio Santi), Giovanni Giacomo De Rossi, Antonio Tempesta, Enea Vico, Francesco Allegrini, Piedmontese, Giuseppe Galli Bibiena, Giovanni Battista Foggini, Giovanni Battista Tiepolo, The Triumph of Fame; (reverse) Impresa of the Medici Family and Arms of the Medici and Tornabuoni Families, Giovanni di ser Giovanni Guidi (called Scheggia), San Giovanni Valdarno, Alessandro Longhi (Italian, Venice 1733–1813 Venice). Also, you can see, The Adoration of the Shepherds by Andrea Mantegna, The Birth of the Virgin, Fra Carnevale, Bartolomeo di Giovanni Corradini, Portrait of a Woman with a Man at a Casement, Fra Filippo Lippi, Saints Peter, Martha, Mary Magdalen, and Leonard, Correggio, Madonna and Child with Angels by Pietro di Domenico da Montepulciano, Madonna and Child with Saints by Giovanni di Paolo di Grazia, The Entombment and Christ in the Wilderness by Moretto da Brescia, Saint Andrew by Simone, Paradise by Giovanni di Paolo di Grazia, The Adoration of the Magi by Giotto di Bondone, Saint Catherine of Alexandria by Pietro Lorenzetti, The Agony in the Garden and Madonna and Child Enthroned with Saints by Raffaello Sanzio, Christ Crowned with Thorns by Antonello da Messina, Portrait of a Young Man by Cosimo di Domenico di Bonaventura, Madonna and Child by Vincenzo Foppa, The Flight into Egypt by Cosmè Tura, The Journey of the Magi by Stefano di Giovanni, Portrait of a Young Woman by Lorenzo di Credi, The Resurrection by Perugino, and many others anonymous Italian masterworks. Three days of celebration, several changes of clothes, star chefs, historic locations and hundreds of guests. All this magnificence has its cost, and the account that bride & groom paid is rather pricey. Only a royal wedding can outclass to luxury and sumptuousness it. The total cost of this romantic weekend is nearly 13 million dollars (just over € 10 million.) The premise that it was something great came up when the pretty UN’s representative received a beautiful lonely seven carat worth about 600,000 euro, and that the wedding would have took place in Venice. Mrs. Clooney has worn in order: a 50s style striped dress by Dolce & Gabbana for her arrival in the lagoon, a long asymmetrical bright red dress by Alexander McQueen, and a clutch by Oscar de la Renta for the bachelorette party. A wedding dress in American style by Oscar de la Renta, and after the wedding, a balloon skirt in a macramé by Giambattista Valli. Finally, women can’t forget the cream pantsuit by Stella McCartney for the civil wedding in the municipal office. After her arriving in Venice, the lawyer of Lebanese origin has nearly stole the show to her future husband, embodying the myth of Mrs. Kennedy. If in the previous hours she had been spotted at the airport in Milan with a sporty outfit, with jeans and sneakers, after the arrival in the lagoon she has unlined all her charm with a look from the fifties: a lounguette dress white-blacks inlaid, blacks big glasses like her long flowing hair, and court pointy shoes. After many false leads and rumors circulated on purpose to confuse the curious, after arriving in Venice George and his girlfriend have materialized in Tronchetto, the car terminal, preceded by a van that unloaded the couple’s bulky baggage, including a trunk by Giorgio Armani containing the dress that the groom had to wear on Monday morning for the civil marriage. Nothing was left to chance, including the name of the gondola-taxi number 256, with the auspicious name “Love”, driven by the loyal Sandro Greco, the man-shadow to each Clooney Venice Film Festival partecipation. Amal like Cinderella, when getting off of the taxi ‘Love’ to go to the hotel Cipriani, she held in the hand one of her shoes with the big stiletto heel. 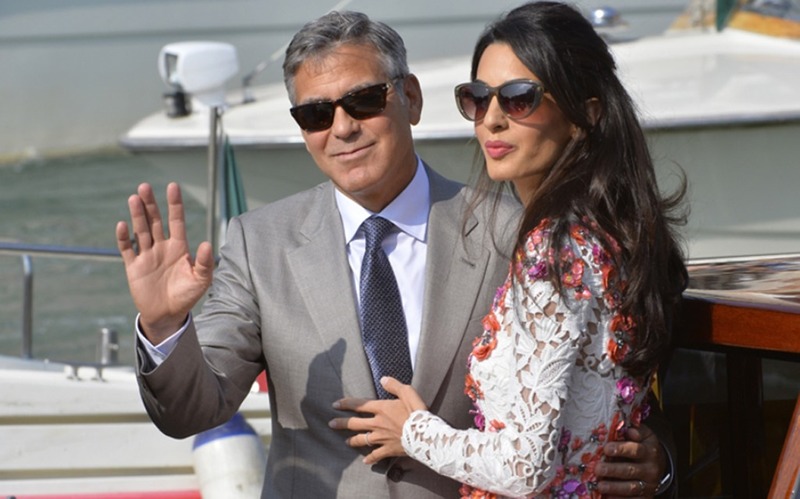 Stumbling upon a typical star’s affectation, Clooney took exception to the bedroom’s furniture in the luxurious Aman Grand Canal Hotel, where the couple had to stay, asking to change it. To manage the wedding of the year, the City even issued an order to prohibit the passage of persons and boats, by land and water, in front of the municipal building that housed the ironclad celebration. And that’s not all! Until Thursday, outside the building next to the hotel, there were some scaffolding installed for the restoration. To have a better sight of the Grand Canal, Clooney decided to shell out a substantial amount to disassemble it in a jiffy. Also, restyling maneuvers for the city, that for the occasion has been dressed up by authorities, without leaving even a gondola out of place. A weekend in Venice has been enough for Mr. Clooney to infringe upon his past lived as much as possible away from gossip. About sixty guests arrived at the Hotel Cipriani in Venice, the day before the wedding, for a pre-wedding dinner party. The day after, the wedding banquet at Aman Grand Canal Hotel, a seven-star where a room’s price ranges from one thousand to 3000 euro per night. George Clooney and his wife chose the singer Andrea Bocelli to spread music in such a magical day. Amal’s bridesmaid has been her sister, while George chose the dear friend Rande Gerber, Cindy Crawford’s husband. To understand the extent to which George and Amal have refined palates, we gotta give a look at the banquet, that among other things included: lobster, lemon risotto and polenta with fried mushrooms. To accomplish this menu there was the chef of the famous Hotel Dolada to Plois, Riccardo De Pra. He has been supported by two teams of outside cooks, one in Pisa and the other in Paris. In this riot of colors and flavors, a particular dessert could not miss , the favorite of the Hollywood star: the Pasticcciotto of Puglia. 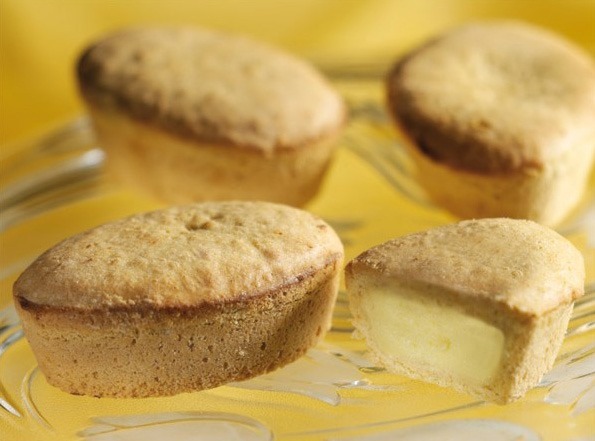 A typical Salento one made of sweet pastry, filled with custard and shaped as a mini plumcake. Not being able to give up this delight, for the wedding George Clooney ordered 2000 of them directly from Otranto, the origin country of these sweet. I wonder if, as some say, this marriage is only meant to support Cloney’s political activity. ARE YOU COMING IN ITALY? Summer: time for vacation and journey. And I hope that this year many of you have chosen Italy as destination. Anyway, the fact is that before venturing in a long trip in another country many people often consult some Internet sites from the country they have to visit. A very useful thing to find information, know prices, to book, or follow the routes of the places to visit. The big issue is for those who do not know the foreign language, with the risk to even get wrong information whether incorrectly translated. I am a traveler too and realize what such an occurrence can mean for a foreign tourist. No problem for the lucky few who have a relative or a friend who lives in the country to visit, of course. I do not want appear presumptuous, but for all those who are preparing to come to Italy, and especially here in Naples, and who wish to receive any information or obtain a translation of some Italian news found on an Italian website, I am available to help them. Therefore, feel free to contact me. That said, I wish a good stay to all of you who are coming here in Italy. Enjoy! I can not know what lies behind the politics and leadership in other nations, and being Italian I can only talk about Italy, though what I say also may be true for other states. Italy is a democratic republic or so it is written and should be in practice, but alas, considered what really happens, often it does not. Although apparently it doesn’t seem so, Italy is only influenced and managed by a few thousand people. People belonging to some castes which over the years have gained power, acting in the shadows. Although apparently it seems that public power is exercised by the political parties and their leaders, by government and its ministers, the power is actually driven, in a subtle and indirect way, by a super caste. Castes or lobbies composed of Directors-General of the Ministries, presidents and directors of government departments and parastatals, members of authority, and of large economic societies. Over the years some castes are formed, such as judges’ , physicians’, or representatives of big Industrial associations (Confindustria), whose leaders are able to influence political decisions without exposing themselves in the first person. So in Italy, the real power lies in the hands of these people, who of course pull water to their mills, uncaring of Italy and Italian people’s destiny. They are the true all-rounder of the specific activity of the government, untouchable, those who decide whether a law should pass or in what manner it must be varied, those who give strategic guidelines, who decide on major contracts, who are able to block the initiatives of any power or to choose a leader who must occupy a significant seat. This super caste is cohesive and interactive, differently from Italian politicians who are not and that, on the contrary, are afraid and become like puppets. These castes are the real masters of Italian politics that operate confidentially. Anyone else, from workers to retirees, from dealers to small businesses, do not have a voice and their protests or claims leave the time they are found. The absurdity is that many Italian folks still believe that something can be accomplished going to vote for changing the government. The Italian term “Extra-communitarian” (Non-EU) refers to immigrants who come from countries outside Europe, but usually here either we use it in a more general way, to mean any person who comes from an underdeveloped/poor country, or to identify, in particular, Africans and Indians (and even Chinese). For us, the “extra-comunitari” are all those individuals who run away from their countries, often with “no art and no part” (like we say), hoping to make do and earn money just to survive. Most of them end up doing the beggars as is the case for almost all of the gypsies (Rom) coming from eastern Europe. Instead, for the majority of Africans and Indians, if things go well, they become street vendors. With the help of friends and relatives, they buy cheap merchandise, then exposing them on the sidewalks, in the local markets, in country’s parties, or strolling on the beach during the summer. If things go wrong, adults or children, they stop at traffic lights trying to clean windshields or sell Kleenex to the motorists for some coin. In Naples and south Italy in general, with a so high rate of unemployment and lack of jobs, what future may have these individuals? Their repetitive (selling) recall, “vuò cumprà?” (want to buy? ), in a sort of Neapolitan dialect that probably they needed to learn and shoot for first, over the years has become so famous that we often use it to identify any African peddlers. The items most commonly sold by Africans are: African crafts (wooden carved items), fashion jewelry, sunglasses, swim suits, leather handbags and belts (often contraband items). Indians are more specialized in selling fashion jewelry (gemstones) coming (from India and clothing, as Chinese in small cheap electronics devices. In the village where every year I go to spend my summer vacation, I find many “vuò cumprà”. For years, some of them regularly sojourn in this small village, staying there for a couple of months. Every day, many of them trace the beach – back and forth – with their cargo of goods. In the afternoon and at night they display their wares on the promenade, directly on the ground or on small stands. They are generally friendly pwho greet all passers-by, and those who have learned the language, often chat with holidaymakers. And it is not unusual that one of them makes friends with some vacationer. When things go well, someone let even his wife and children to come in Italy, and then we see them all together next to their stand. Usually these immigrants live in groups in small flats to share the expenses, and needless to say that theirs is a poor existence in the balance, evidently not so bad as the one lived in their countries. They live isolated, in poor hygienic conditions, and often you see them sleeping on the sidewalks between pieces of cardboard or in small huts arranged for the occasion. Sometimes, the smell of piss forces you to hold your nose…. The bordering neighborhoods are often the best place for them. Remote districts where there still find small spaces and where in a flash their slums make inroads. The only people we Neapolitans fear most, are nomads and gypsies. They move in groups, always attended by their family, usually dirty and smelly, not looking for a job, but simply to beg, sometimes trying to pity the passer. Often, they wander around the neighborhood with wife and children in tow, with a guitar or a music-cassettes playing some old Neapolitan song. They scream and call below any dwelling or buzz so that some coin is thrown from balconies. Others rummage through the garbage looking for items that they can sell to those that treat old and used objects. Unfortunately, these immigrates have the reputation of being thieves and especially their children, that if they can, steal and run away. Sometimes it has happened that even our children have been kidnapped, then being reported as missing and very difficult to trace if you don’t know that it has been a gypsy to do that. I’m not racist and I feel very sorry for these people, but although they know Naples to be a city with a good heart, I do not think it is appropriate to make them freely get into areas already at risk, with no money, no job and no a fixed abode. Despite all this, you’ll never heard a racial slur against these people, and usually they are left alone, even by storekeepers and police. If a cop or a financial police would approach one of them, many Neapolitans tried to help and devote a good word for the victim. These are Neapolitans, for better or for worse! Christmas, time for gifts and evaluations. In Italy, several say that Christmas is a celebration for children, but I’m not at all convinced. Maybe because it represents Jesus’ birth, but also those who are not observant or true Catholic Christians are involved in its tender and compassionate atmosphere. Others say that they decorate the tree or make the crib because they have children at home, but underneath it all, the first to find pleasure in doing so are just ourselves, the adults. Christmas and New Year are also holidays when family gets together, people have meal together or meet to exchange greetings. A moment of aggregation, dialogue, openness. In the end, everyone becomes better and, believers or not, the Christmas‘ purpose and true meaning is safe. Too bad it only happens once a year and lasts only a few days! Whether it’s Befana or Santa Claus, this is also the period for toys to children. 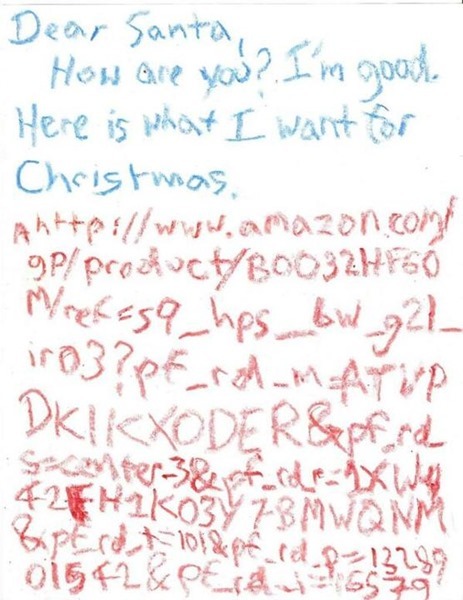 Who have never written a letter to Santa Claus? Italian children are always polite and respectful in their requests. 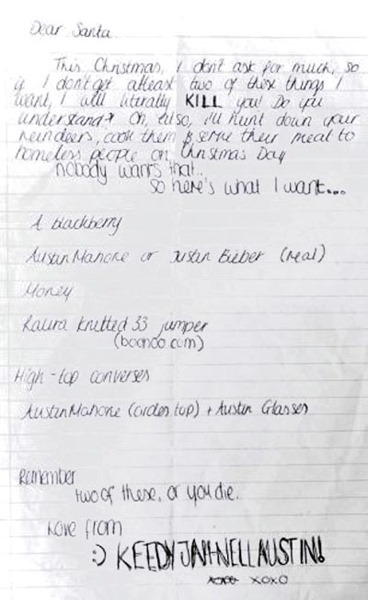 As usual, they write to have been good kids and end the letter by saying : “I promise you that I will be more good in the future… “, in the hope to get the toys they want. 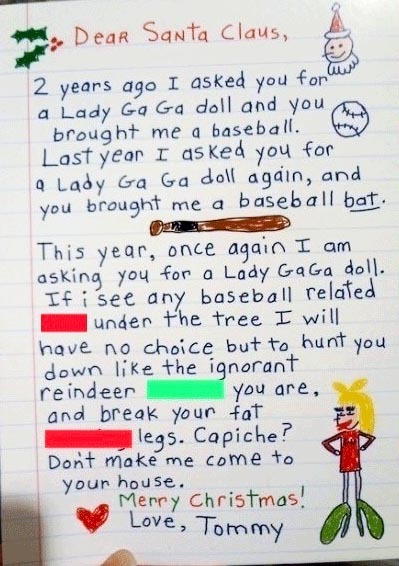 Usually, children write their letters to Santa with the help of parents or teachers, and many of them before puberty already are aware that it is only a childish thing. In my day we were content with little, even a simple plastic gun became an important gift for us children, where Christmas was the only time to get a toy. Then, it was custom to hide gifts, so, early in the morning, we woke up excited and went in search of the package for the whole house. I do not deny that when my son/dau were babies, I repeated this ritual. In the night, before sending children to bed, we together put the socks hanging somewhere with their letters, and to pretend that Befana or Santa Claus found something to eat, I let a slice of cake with a drink nearby. They are considered to be short-tempered and you have to treat them well! Then we all went to bed. As soon as children had fallen asleep, I got up and carefully substitutive socks with colorful stockings filled with sweets, took off the cake’s slice, leaving a few crumbs here and there, emptied the glass, and then I hid the various toys in the room. Needless to say that the next morning, they were the children to get up early, not in their shoes to see if Befana or Santa Claus had come. Their astonishment at seeing the crumbs, empty glass and sparkling socks really is priceless! 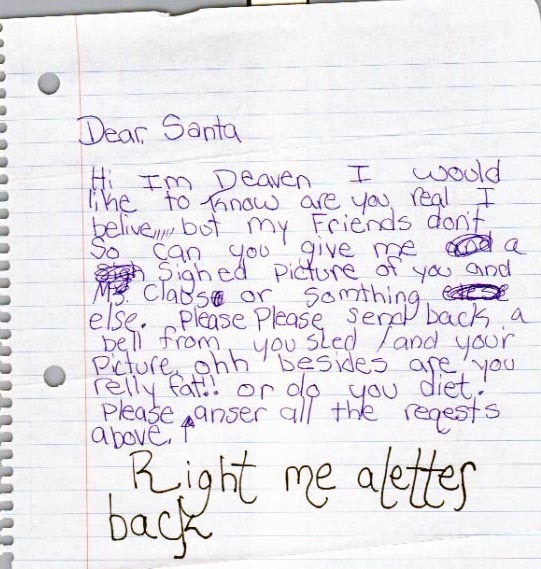 The tenderness and naivety of children leaves you speechless. After the first moments of perplexity, shown by their eyes wide open and sweet expression of wonder, the first gifts, the biggest, were sighted. And then opening the package to see what’s inside… another moment of surprise and wonder…. Really beautiful experiences you never forget. for a Happy and Saint Christmas to you all.